Videoguys Australia has been serving the video markets for more than 14 years. Through all those years our goal has been to earn the trust of our customers and provide them with sound, solid advice. To do this we knew we must offer competitive pricing, but we also knew low prices alone could not and would not make our business superior. We were determined to combine honest and helpful dealings with outstanding service before, during, and after the sale. We understood that long term customer satisfaction depended on our ability to maintain a knowledgeable and courteous customer service staff assisted by the best support systems. And we decided on a way to describe our business; Knowing that Professional Videographers are understandably the most demanding customer group we serve, and knowing that their repeat business would be essential to our success, we adopted the phrase "Your Ultimate Audio & Video Source" to describe our business focus and use it as a promise we are dedicated to keeping. We understood that long term customer satisfaction depended on our ability to maintain a knowledgeable and courteous customer service staff assisted by the best support systems. And we decided on a way to describe our business; Knowing that Professional Videographers are understandably the most demanding customer group we serve, and knowing that their repeat business would be essential to our success, we adopted the phrase "Your Ultimate Audio & Video Source" to describe our business focus and use it as a promise we are dedicated to keeping. It is a daily reminder that we must give every customer and every visitor the kind of respect and dependable assistance that would please a professional and thousands of satisfied customers are testimony to the success of our efforts. Videoguys has Australia's most extensive inventory of Video and Audio products, most of which are available in store, all of them ready for rapid delivery anywhere in Australia. Glancing at our website only begins to show the variety of stock available. Click on any of our product information links and you'll find that there are extensive sub-departments within departments, including every type of Video and Audio product and accessory, including related supplies. Videoguys inventory consists of more than 8,000 stock items (which is always growing), and products are available for shipment every business day from our Notting Hill Victoria facilities. 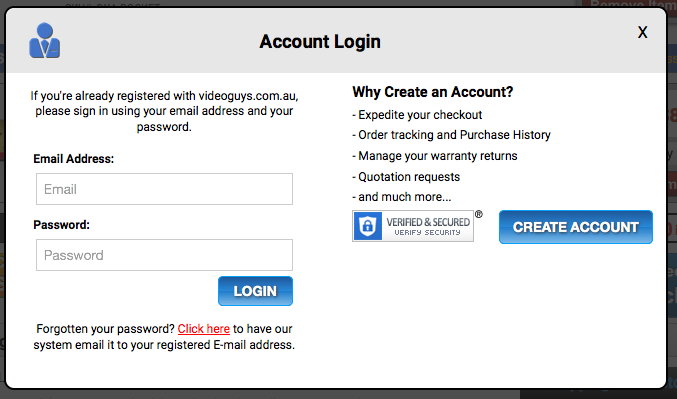 Shopping at Videoguys Australia is easy! Customers can shop in the way that is most convenient to them: by visiting our showroom, by phone, by mail, by fax, or through our comprehensive website. Which ever way the customer chooses, no matter the size of the sale, Videoguys is here to help! Our commitment today is to provide you with the same great service and Fanatical customer support that we have shared with thousands of customers Australia Wide. Our knowledgeable advice, FREE tech support, are still unmatched in the industry and will help you get the right Video and Audio equipment for your needs, regardless of your level of expertise - beginner, event & corporate videographers or broadcast professional. Call (03) 9543 8885 and let us answer all your questions about your next equipment purchase! The mission statement this business runs under: "It is the mission of Videoguys Australia Pty Ltd to develop and maintain long-term customer relationships by providing the best value in the Pro Video/Audio industry. We will strive to provide high quality products and services that meet or exceed the needs of our customers. Our mission will be accomplished through an ongoing dedication to customer satisfaction, continuous improvement, employee empowerment and innovation"
Our services ranging from providing information about a product, to supplying the product as well as to support the finish product to the end user. We only offer the latest and greatest of innovative high quality Video/Audio products. We provide our customers with a good 'knowledge' about the product we sell, to get a better understanding and to be able to make a sound decision before buying the product. We also provide solutions based services, not merely selling a product which may not meet our customers requirement. We can supply fully user customised solutions configuration to suit the different needs of each user. Our solutions range from home, office, business users. Our business model is customer oriented, we are not the typical online business or retail business that focus only in price, but one that focuses in customer service, fanatical support and satisfaction. You can order and pick-up from our warehouse/Showroom or we can send your order Australia wide via our courier service. We accept Eftpos and all major Credit cards (a 3% surcharge applies for Amex and 4% for Diners credit cards), Australia Money Orders, or you can deposit cash directly into our bank account for faster processing. Our commitment is that we will always strive to improve ourselves so we can better service our customers. In order to improve our turn around time to process orders, we encourage that all orders must be placed on our website prior to pick up. All prices include GST and are listed in Australian Dollars only. Only official Australian versions listed. Because of the dynamic nature of this industry (e.g. exchange rate variations and other variables beyond our control), prices, versions, product details and availability are subject to change on a continual basis without prior notice. Errors and omissions excepted. While every effort is made to ensure accuracy, currency fluctuations and other issues with our suppliers may result in unforseen changes to advertised information. For out of stock items, delivery dates given are only estimates. Goods are not supplied on a trial basis, please check specification and compatibility with the manufacturer prior to purchasing. Although our staff can offer advice, they cannot confirm product compatibility. Goods ordered by fax or post will be charged at the current price at the time of receipt. Finance is available through Flexirent for hardware items over $500. Benefit from tax deductible monthly payments (may not apply - seek professional advice) which are good for cashflow. How does it work? Simply select the equipment needed and Flexirent will buy it and rent it back to you. Figures based on 48 month continuous term and include GST and stamp duty. Flexirent is available to approved customers on selected products. Call Flexirent on 1800 240 102 for more details. Please Note: Videoguys Australia Pty Ltd does not sell items or imply items "subject to finance" before purchase. It is the buyer's responsibility to arrange this prior to leaving a holding deposit on items. Videoguys Australia WILL NOT refund any deposits on reserved stock items after 14 days, unless otherwise arranged. When purchasing academic, educational or government licensed product, it is a requirement of the manufacturer that proof of student enrolment or employment from an educational institution or government department is supplied. Simply email/fax proof of identification (refer below) stating your web order number to [email protected] or (03) 95438865. Please note that product cannot be dispatched until required information is received and approved. Academic, educational or government product may not be used for commercial purposes. Proof of enrolment/employment must either be a copy of an official photo identification card from the education institution or official documentation from the educational institution's registration office or government department verifying that the individual is a current student/employee of the institution at the time of purchase. For Microsoft products, if the official identification card does not include a photograph of the student/employee, the copy of the identification card must be accompanied by a secondary photo identification. Please include your web order number together with proof of identification to aid our processing of your order. Security:The security of your personal information is very important to us. In an effort to protect your personal information, we use Secure Sockets Layer (SSL) technology with 128 bit encryption. If your browser supports SSL (most current browsers do), it will automatically encrypt the information you provide to us on the secure pages on our site, before sending it over the Internet. Videoguys has obtained a digital certificate from thawte SSL123 Certificate to a leading provider of Internet trust services. When visiting a page on our site that includes any of your personal information, the bottom or top of your browser window will display, an icon of a closed lock or an unbroken key (depending upon your browser). This indicates that you have successfully connected with our secure server. To authenticate the security of your connection before submitting any of your personal information, you can double click on the icon to display our digital certificate. Some browser versions and some firewalls do not permit communication through secure servers. In that case, we suggest that you visit the Videoguys Australia Store, or contact us by phone, or fax or email your order to us. If an account is set up, you may place an order on your account (see 'Credit Accounts' below). Alternatively, please call (03) 9543 8885 place your order over the phone. 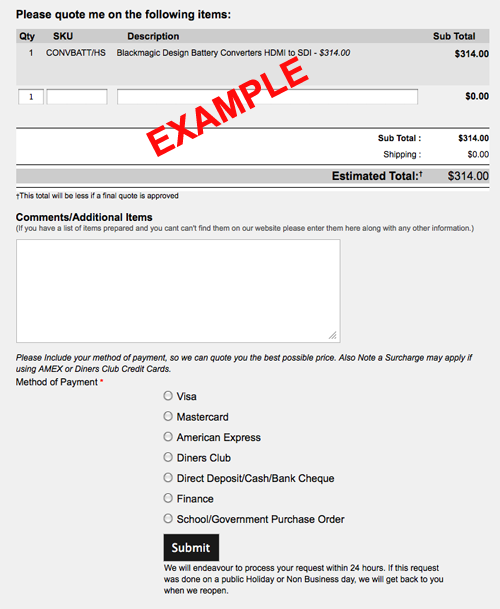 Please indicate you Order Number when making online payments. CREDIT ACCOUNTS: Accounts may be opened for Government Departments, Education and selected incorporated businesses, subject to credit checks. Previous trading history a must (Govt. Dpts excepted). Please call (03) 9543 8885 to have a Credit Application sent to you. All Goods shall remain the property of Videoguys Australia Pty Ltd until such time as the customer has paid the full price of the goods. At Videoguys Australia Pty Ltd, we work hard to offer you the most competitive pricing and accurate product information. Because of the dynamic nature of this industry (e.g. vendor price changes and other variables beyond our control), prices, promotions, versions and availability advertised are subject to change without prior notice. Please be assured of our every effort to ensure the accuracy; however the documents and graphics published may contain technical inaccuracies or typographical errors. Videoguys Australia Pty Ltd makes no representations about the suitability of this information; it is provided "as is" without warranty of any kind. If an error is made or a product is listed at an incorrect price, Videoguys Australia Pty Ltd shall maintain the right to refuse or cancel any orders placed. If the order has been confirmed and charged to your credit card, Videoguys Australia Pty Ltd shall immediately issue a refund or contact you, the customer for further instructions.